Justified is based on the Elmore Leonard short story “Fire in the Hole” (read it here) which provides the story for the pilot episode, in which U.S. Deputy Marshall Raylan Givens returns to his hometown of Harlan, Kentucky, to track his old coal-mining buddy Boyd Crowder, an ex-con now leading a Neo-Nazi terrorist group, after Boyd blows up a black church with an RPG. 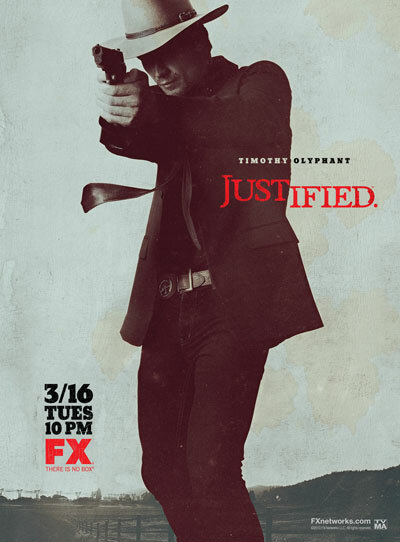 Raylan meets Boyd at the home of Boyd’s sister-in-law Ava Crowder; [SPOILERS AHEAD] firearms are brandished and Boyd comes out on the wrong end of Raylan’s six-shooter. Boyd dies at the end of the Leonard story, but not in the Justified pilot. Which means veteran actor Walton Goggins will continue to appear (fun link: Walton Goggins’ blog from India in 2009).